This is Wilbur. Wilbur is 7 years old and stays in Cottage A at Amani Baby Cottage. He lives with 7 other “brothers” and his Mamas. As the sun rises Wilbur wakes up and pulls clothes from his bin on the shelf. He brushes his teeth at the little sink and receives his breakfast from his cottage Mama. 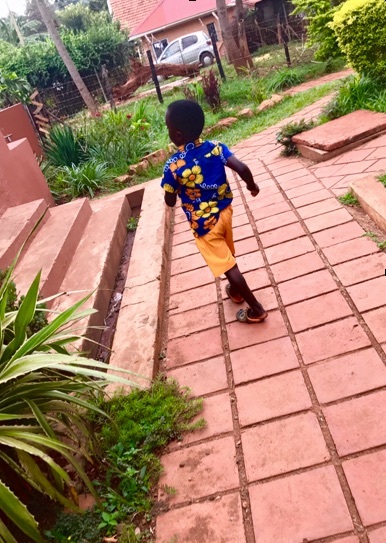 As one of the older boys at Amani, Wilbur is entrusted to help dress the younger boys and help with small chores in the cottage. Wilbur often takes the initiative in the cottage and as a helper he can often be found cleaning or assisting the Mama’s in a task. Soon after waking up, his Mama will iron his school uniform and he’ll get dressed in his bright orange shorts and his blue shirt. At 9am his Mama will hurry him and his classmates from Cottage A to the preschool room for a morning of learning. As class continues Auntie Allie will read a book to the children and after they will shuffle out onto the porch to drink porridge, and do activities for that day. Wilbur sits next to Joram and John, the other two older boys from his cottage. As school ends, Wilbur returns to his cottage and leads the table in prayer. “Hands together” he begins, “Eyes Closed”. The boys at the table repeat every word. “Bless our Mama” he prays, “Bless our auntie, bless our food. Bless our brothers and sisters. In Jesus’ name, amen”. “Amen” the voices echo. Wilbur, Joram, and John walk down the path to Mama Cook’s outdoor kitchen and are served a plate of traditional Ugandan food. Beans, Posho, and chicken. After nap time the cottage doors open and all the children from Cottage A, B and C run out into the yard to play. As a baby falls, Wilbur picks him up and dusts off his shirt. The children at Amani can be found singing songs, swinging with each other in the playground, or playing with the Mamas and Aunties. After a few hours everyone is called back into the cottages. Dinner is served and the night routine begins. One by one the boys are bathed. Wilbur helps maneuver all the babies to the shower area and then assists the Mamas in putting diapers and pajamas on each one. Wilber and his older brothers can stay up a bit later than the other children and occasionally they help clean up the cottage or watch part of a movie. Towards 7:30 Wilburn, Joram, and John will head into their bunk beds to get rest for the next school day.